I was so excited when I heard about Ireland getting their own monthly beauty box…think Glossy box, except this one, Powder Pocket, is based in Ireland. In fact it was set up last year by a Connacht rugby player called Michael Swift, I know a rugby player and a beauty box.The lovely girls at Powder Pocket sent me the June box to review and I was quite impressed. The packaging of the June box was themed by the Brazil 2014 World Cup. PIXY LIME BODY SCRUB CUBE - This exfoliating scrub smells so beautiful. It smells super refreshing. But even better, this lime body scrub cube left my skin soft to the touch, silky and smooth. The sweet smell and healing properties of apricot oil, enriched with vitamin E, moisturizes and enhances the skin's own regeneration system. It is also great for removing fake tan, or exfoliating before applying it. 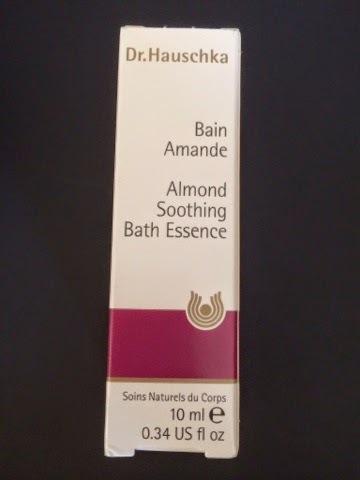 DR. HAUSCHKA ALMOND SOOTHING BATH ESSENCE - With a delicate and uplifting scent, Almond Soothing Body Wash from Dr. Hauschka is a soothing solution for cleansing the skin. This bath essence quiets the mind, instilling feelings of warmth and comfort. I loved this product, but unfortunately I'm not much of a bath person so it won't be a future purchase. SHISEIDO ADVANCED BODY CREATOR SUPER SLIMMING REDUCER - This dewy gel-cream provides slimming and powerful anti-cellulite effects…. With that kind of USP I just couldn't wait to give it a try.This light and very fragrant gel is intended for use on the entire body, with special emphasis placed on those areas that tend to accumulate cellulite; Shiseido claims that Advanced Body Creator can actually speed up the burning of adipose tissue as well as prevent new fat cells from forming in general throughout. This revitalising and cooling gel cream gives a slight tingling sensation when applied which is a confirmation that the product is really working. It felt a bit odd at first and I must confess I thought I was perhaps having some sort of reaction until I read all the information properly. Have yet to see any results but I will keep you posted. THE BODY SHOP SUPER VOLUME MASCARA - It's a very wet mascara, takes its time drying, and you need to blink don't you? So, inevitably, you end up with a bit of the product on your face/eye lid. Not my favourite, it's an ok day time mascara but to be honest left my lashes a bit spidery for my liking. On the plus side there was also a voucher for free eyebrow threading in the body shop in the box. This I can't wait to use ! NIA INTENSIVE RESTORING MOISTURISER- I was so excited to try this product after seeing it on Dragon's Den. This moisturiser is 100% natural and is a blend of butters, herbs and essential oils. It is also concentrated unlike the moisturisers you buy on the high street which are made up primarily of water, but surprisingly it is light in texture and soaks in easily. This product will definitely be a purchase for me in the future.